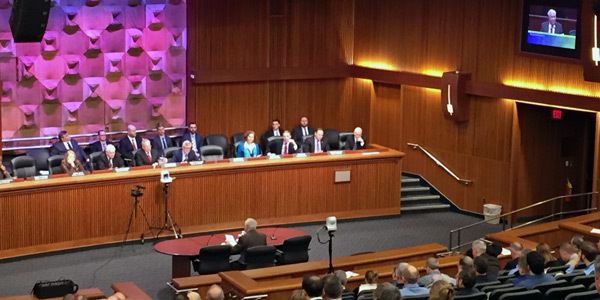 ALBANY, N.Y. — A New York State Assembly hearing Monday to explore the Cuomo administration’s subsidies for upstate nuclear plants left lawmakers frustrated as the Public Service Commission and the New York State Energy Research and Development Authority declined to attend and Exelon sent no senior executive with knowledge of the subsidy negotiations. Exelon, owner of all the nuclear plants set to receive the zero-emissions credits, sent five witnesses, most of them engineers, with the highest rank being a plant vice president. “Maybe you can take notes and send your answers later,” Dinowitz told them sarcastically. Exelon also submitted testimony from Joe Dominguez, executive vice president of governmental and regulatory affairs and public policy, who said the company would spend $700 million on the plants because of the financial assurance provided by the ZECs. The ZECs would benefit Exelon’s R.E. Ginna, and Nine Mile Units 1 and 2 generators — and the James A. FitzPatrick plant it is purchasing from Entergy — for more than 12 years. “The closure of these plants would have resulted in a staggering increase in air pollution throughout New York because the electricity void created by the closures would have been filled by coal, oil and gas plants operating in and around New York,” Dominguez said. The PSC said it was unable to attend because of scheduling problems. “Unlike the 24 public hearings that the Public Service Commission held across the state in developing the Clean Energy Standard [CES], which were scheduled many weeks in advance, the Assembly only informed us of this hearing late last week, and so we were unable to attend due to scheduling conflicts,” PSC spokesman James Denn said in a statement. The Assembly issued the public notice for the hearing on Monday, Feb. 27. Instead, the state agencies submitted written testimony from PSC Chair Audrey Zibelman, NYSERDA CEO John Rhodes and Richard Kauffman, Cuomo’s top energy adviser. The statement defended ZECs, part of the CES, which also requires that the state generate 50% of its electricity from renewable resources by 2030. 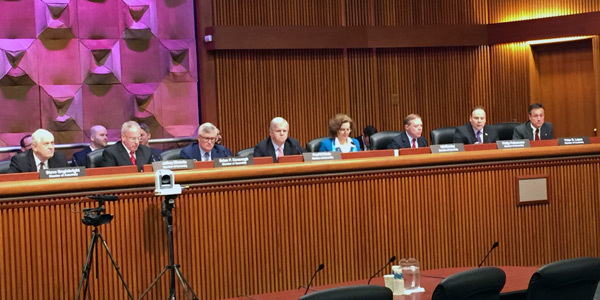 Several New York City-area legislators have questioned the wisdom and process of last August’s decision by the PSC to approve the CES and ZECs. The program distributes costs statewide; in its first two years, all New York energy consumers will pay an additional $965 million to keep the nuclear plants running. The costs may rise by as much as 10% in each successive two-year tranche, for a potential total of $7.6 billion. Dinowitz chaired the hearing in place of Energy Committee Chairwoman Amy Paulin, who was unable to attend. 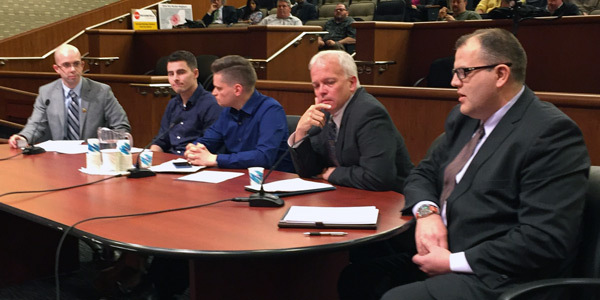 The other committees participating in the hearing were Environmental Conservation, chaired by Assemblyman Steve Englebright (D-Setauket), and Consumer Affairs and Protection, chaired by Assemblyman Brian Kavanagh (D-Manhattan). Englebright said that he remembered when nuclear power was being touted as being “too cheap to meter, which doesn’t seem to be the case today.” Kavanagh said he was concerned whether the ZEC charges are fairly imposed and in a transparent manner. Subsidies Too Generous to One Company? Horner said that the state already has 800,000 electricity users who are 60 days or more in arrears on their electric bills and that the CES-related rate hikes would be a hardship for them. The Cuomo administration says the CES, including the ZECs, will add less than $2/month to the average residential customer’s bill. Exelon expects the New York ZECs and a similar program in Illinois will add 17 cents/share to its 2017 earnings, 6% of its total profits, according to Crain’s Chicago Business. Brodsky urged the Assembly to reconsider the decision to spend an estimated $303,000 per job per year in subsidizing “decrepit” nuclear facilities. “They’re fixer-uppers, and it costs more to do that than to live in a new house,” he said. Exelon sent five witnesses to the hearing: Joseph Pacher, site vice president at the Ginna plant; James Vaughn, senior engineering manager at Nine Mile Point; Adam E. King, radiation protection supervisor at FitzPatrick; John Scalzo, engineer; and James Melville, senior radiation safety operator at FitzPatrick. 2015, Pacher replied, which was when the company began negotiating a reliability support services agreement at Ginna, which FERC approved in March 2016. Kavanagh asked if the Ginna reactor wasn’t the same design as that at the Fukushima Daiichi plant in Japan, which failed when it was flooded by a tsunami in March 2011. Pacher admitted the similar designs but said it was the Japanese plant’s location on the Pacific Ocean that was its biggest vulnerability. “The worst thing for Fukushima was its location, but examining their experience did lead us to re-evaluate our event amelioration strategies,” he said. In a separate action, a group of energy companies and trade groups in October filed a suit in U.S. District Court for the Southern District of New York, claiming the ZECs intrude on FERC’s jurisdiction over interstate electricity transactions. The suit asks the court to find the ZECs invalid and order the PSC to withdraw them from the CES. In a last-ditch effort the save the FitzPatrick nuclear plant, New York regulators are proposing financial incentives that could be available to the plant's owners by July. FERC approved Exelon’s acquisition of the troubled James A. FitzPatrick nuclear plant in New York, rejecting a protest that its review should have included the impact of a state-mandated ratepayer subsidy.